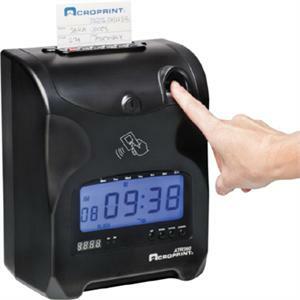 The ATR360 is a top-loading punch clock that uses familiar time cards for recordkeeping purposes and offers a biometric fingerprint scanner to eliminate costly "buddy punching." Employees simply press their enrolled finger against the fingerprint scanner on the clock. Once their fingerprint has been scanned and accepted, the time will be printed on their time card. If you prefer to use badges, the ATR360 also includes a proximity reader that allows the use of either proximity badges or convenient key fobs to identify employees. The clock features a large backlit digital time display, two-color printing and a built-in musical chime. This clock automatically adjusts for Daylight Saving time changes nad can optionally be equipped with a battery backup to allow punches even during a power failure. The clock requires the use of ATR241 time cards. Supports weekly or monthly pay periods. Two-color printing identifies early and late punches in red for faster, mor accurate payroll processing. Proximity reader used badges or key fobs to identify employees. Optional battery allows employees to clock in and out even during a power outage.